The first SAR (Search And Rescue) The Americas conference (presented by the Shephard Group of the U.K.) was held May 20 and 21 in Arlington, Virginia, just outside Washington D.C. Attending were representatives from 57 countries. While there were only a few hundred attendees at this first ever event, the quality was very high, with top brass or representatives from all the U.S. SAR resources in evidence, along with senior representatives from a number of other countries. It served as an excellent forum for a number of SAR issues, but most importantly, allowed for the diverse elements of SAR, both military and civil, to come together and exchange ideas and information informally as well as via the formal presentations. From our perspective, the biggest news from the exhibition portion of the conference was that 406 MHz emergency transmitters are getting smaller and smaller. 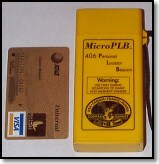 We saw the first COSPAS-SARSAT approved PLB (Personal Locator Beacon) that is truly pocket sized. We can think of no more important a development in SAR than the ability to enable individuals to carry a pocket sized 406 beacon on their person at all times. Many lives would be saved. Captain Gabriel O. Kinney, United States Coast Guard Chief of Search and Rescue and the Chairman of the conference, answered one question with a telling remark that emphasized the end of COSPAS-SARSAT processing of 121.5 signals is just eight short years away. He noted that it probably ought to be illegal for those selling 121.5 MHz transmitters from claiming satellite capability. We agree. Anyone buying a 121.5 only ELT/EPIRB/PLB is just operating on borrowed time if they are planning on depending on SARSAT to locate them (they still have their uses, however). USCG Lt. Commander Paul Stewart, the Coast Guards' 406 MHz evangelist, was there showing off an array of 406 MHz transmitters, including the newly COSPAS-SARSAT approved MicroPLB from Microwave Monolithics Inc. of California. Approval was gained just a few days before the conference. Only 1 x 2.25 x 4.75 inches (2.54 x 5.7 x 12 cm) and a weighing a mere 9 ounces (255.4 gm), this PLB truly redefines the 406 packaging paradigm. While a PLB doesn't have to meet the tough impact and environmental requirements of an ELT, it is obvious that the electronics and battery life issues restricting size minimization are being redefined. Operating life is rated at 24 hours minimum (at -20 degrees C) according to the company literature. The blade antenna wraps around the case and is retained inside a cap that must be removed to get at the activation switch. The antenna unfolds automatically once it is no longer retained by the cap. Switching the beacon on is accomplished by pulling a pin. A pair of LEDs signal activation. The unit will accept GPS inputs to transmit an exact location. The developer anticipates incorporating a GPS chip into the beacon eventually, with reportedly no increase in size of the MicroPLB. A wrist lanyard is included. The unit is only rated "water resistant" (1 meter for 1 hr.) Hopefully, making a truly waterproof version won't be too difficult. A fully marinized version would also need a rotateable antenna so it could be adjusted to the vertical, no matter at what angle the unit is held. A 121.5 MHz homing signal is an extra cost option. If you want one, you'll have to shell out approximately $2500! (Of course, courtesy of the idiot bureaucrats at the FCC and FAA, you'll also have to purchase it outside the U.S. since the dolts still refuse to approve 406/121.5 PLBs for sale in the mainland U.S.) He indicated that he expects the cost to drop, if the military buys the unit or technology, thereby lowering production costs. Tadiran Spectralink of Israel was there showing off their military SAR goodies, including the "peacetime" Personal Beacons Locators that are being purchased by the U.S. Navy for Naval aviators. The AN/PRC-149 incorporates a 406 MHz beacon (along with 121.5/243 MHz), programmable UHF/VHF transceiver capability, and includes GPS capability. The smaller AN/URT-140 is a beacon alone, though it accepts GPS inputs from an external GPS receiver. The real news is that the company's representative indicated that there are definite plans to market a "competitively priced" commercial civilian version of the URT-140, and possibly even the PRC-149 down the line. Designed to be ejected from fighter aircraft with the pilot, the URT-140 is plenty tough, despite its small size, 2.6 x 4.63 x 1.25 inches (6.6 x 11.8 x 3.2 cm), not very much bigger than the MicroPLB. It is the weight, 24 oz (680 gr), and packaging that make the big difference between the units. The unit is not as integrated a package and the blade antenna simply wraps around the outside of the metal cased unit. Battery life, however, is a full 72 hours at -40C. While not the 406MHz beacon we prefer, there was a 121.5 beacon shown that may also prove somewhat revolutionary. 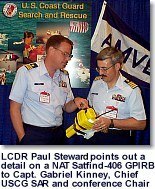 The Sea Marshall is designed as a Class B EPRIB and as the signaling portion of a Man Overboard (MOB) Warning System. While available in Europe for a while, the product line has been purchased by Sea Marshall Rescue Systems USA Ltd. and manufacturing will be moved to the U.S. in the near future. The unit is not only diminutive in size, 2.9 x 2.75 x 1.14 inches (7.3 x 7 x 2.9 cm), and ultra-light at only 4.5 oz (128 gm), it is also affordable at only $129 suggested retail. At that price (probably less at discount) there is no excuse whatsoever not to equip yourself and your crew or passengers with one of these beacons. Compared to the price of a pocket ELT, this is a bargain. A pilot need only slip it in a pocket to improve their survival chances. Power is supplied by a field replaceable standard 9 volt lithium battery. Battery life is rated at 6 hours at -10 degrees C, 40 hours "average" at 35 degrees C. Given the ease of battery exchange, carrying a spare battery or two is no big deal for cold weather operations. The antenna is incorporated into a unique clear plastic neck strap (loop) that also serves as a visible flashing beacon. The electroluminescent fiber incorporated into the neck strap appears to provide a relatively bright locating signal, though we'll have to wait for our field tests to confirm the claimed three to four mile surface visibility range (and to determine an air to ground range). The loop can be disconnected from one side of the case if it is desired to extend the antenna for maximum range. The unit can be activated manually, or may be armed so that it activates after 20 seconds water immersion for MOB use. An o-ring is used to prevent inadvertent activation, which is the only thing that detracted from an otherwise excellent design. We'd prefer something a bit more positive. A green LED on the top of the case flashes when activated and a battery low warning is provided by a red flashing LED. The company showed a prototype SOSpenders inflatable life vest equipped with a pocket to carry the Sea Marshall. Of course, for mariners, a better solution than SAR if you lose someone overboard, is to be able to be notified and find and recover them yourself (recovery being a whole other problem, of course). The complementary Sea Marshall Crewguard MOB warning alarm works in conjunction with the Sea Marshall to warn that someone has been lost overboard. It can be hooked to an external loudspeaker, GPS, or other systems to assist in alert and recovery. A more sophisticated Crewfinder direction finder allows for location of any 121.5 signal relative to the mounting platform, but it is probably not applicable to most small vessels. Look for these in a boating equipment catalog in the near future. No more excuses! Search & Rescue Pty. Ltd of Australia (SAR Australia) and Winslow LifeRaft Co. were pitching SAR Australia's Precision Aerial Delivery System (PADS). This deceptively simple and "affordable" system allows for extremely precise air drops of survival equipment, a slightly modified USCG de-watering pump, or a life raft (hence Winslow's involvement), from virtually any aircraft, supposedly with minimal training and practice. The system has been adopted by the Australian Maritime Safety Authority which operates AusSAR, about the closest thing to a Coast Guard that Australia has. It would obviously also be potentially useful over land to drop survival supplies to stranded survivors who may have to wait a while for rescue. SAR Australia was showing independent video (Australian 60 Minutes TV show) of test drops using an unmodified Cessna 310 (light piston twin) aircraft. The precision with which the drops were effected by the system's developer was amazing. The trailing line often fell directly into the outstretched arms of the "survivor." While there was plenty of skepticism from the many booth visitors with air drop experience, there was also plenty of interest, assuming PADS can actually deliver the goods -- both literally and figuratively. Compared to existing air drop systems, which are expensive, heavy, clumsy, require dedicated aircraft, and are difficult to deploy with extreme precision, the affordable cost and effectiveness promised by PADS offers many advantages. Lack of precision drop capability often means USCG crews have to make multiple air drops to accomplish a single delivery. It will be interesting to view a live demonstration of the system, hopefully in the not too distant future. Many night time marine rescues are effected as a result of finding the survivors using searchlights which reflect off the retro-reflective material applied to most marine life rafts, life vests, and vessels. Without the retro-reflective material, which reflects light back to its source no matter from what direction it is coming, many of these survivors would never have been found. Even with 406 beacons to get SAR very nearly on top of a survivor, it can still be difficult to actually locate a survivor on a stormy sea at night. The problem is that the range of even the very high-powered searchlights on vessels is limited, the less powerful lights on aircraft even more so (though night vision devices used in airborne SAR help compensate a bit). Fog and poor weather conditions further inhibit the effectiveness of these lights to illuminate a survivor. Now comes a potential solution in the form of the Greatland Laser LLC Rescue Laser Scanner (RLS). Originally developed as a better means of lighting runway centerlines, it turns out to be an extremely effective piece of SAR equipment. The handheld, 5 volt, battery powered 532nm diode laser sources is equipped with plano-convex (flat on one side and convex on the other) optical lenses. In this design, the laser is not a pinpoint light source we normally associate with a laser, but rather a thin, expanding vertical line of green laser light. Swept across the surface horizontally, while the thin beam is held vertical, it covers a vast swath of area with each sweep, from near the point of origin to the far horizon. When it passes over a retro-reflective piece of material (or even any normally reflective material that is at the right angle or which is curved) it flashes very distinctively back at the laser source, much like a mirror flash. You can't miss it. The company claims that the reflected light from a 4 x 4 inch (10.16 cm) piece of retro-reflective material is visible from twice as far as a conventional searchlight from a vessel on the surface. From an aircraft at normal search altitudes using a 100mw RLS range would be in excess of four miles (even without night vision devices) and is eyesafe at 600 feet, or before it reaches the surface. The laser is also reportedly less affected by fog and poor weather than conventional searchlights which are severely effected. More powerful versions would have even greater range. 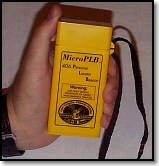 A smaller, less powerful, penlight sized handheld portable version of the SLR could be carried for ground to air signaling, in much the same way as a flashlight is used, but with far greater effect. In an infrared wavelength, it would also make a dandy covert signaling device for downed military pilots and crew. The USCG has informally tested the SLR with positive feedback and Greatland is hoping to hear by September if their solicitation for funding of further testing and development of the technology is approved. The SLR seems to hold great promise for saving lives, as well as reducing SAR costs by hastening rescue. If eventually adopted, we would expect to see even more use of retro-reflective material as its effectiveness in conjunction with the laser will become an even greater contributor to survival. As a pilot, the most appealing piece of hardware on display (albeit in model only), and subject of a compelling presentation, was the Bell Helicopter/Augusta HV-609 Tiltrotor, a SAR variant of their civil/commercial 609 Tiltrotor currently under development. While we also heard exciting presentations on the status of the military V-22 Tiltrotor and on SAR applications for the Eagle Eye Tiltrotor UAV (unmanned air vehicle), it was the HV-609 that captured this editor's imagination. The HV-609 certainly seems to fill a big hole in USCG SAR capabilities and would vastly increase their SAR capacity. One can only hope that the concept eventually comes to fruition and the USCG is able to take advantage of this extraordinary new dimension in aviation SAR. In the meantime, in front of some 200 attendees this editor was promised a flight in the not too distant future, once the basic 609 Tiltrotor prototype is cleared for demonstration flights. I can hardly wait. 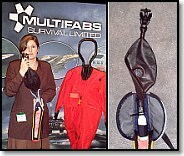 Multifabs Survival Ltd. and Concorde AeroSales exhibited the latest prototype of the Multifabs Breath Assist escape breathing device. Incorporating both a rebreather and a small supplemental air cartridge, it is designed to combine the best qualities of both concepts, while eliminated many of their drawbacks. It is expected to provide the escape time of a conventional HEED (Helicopter Emergency Egress Device) without the attendant weight and bulk, while providing greater escape time than a rebreather style escape device without appreciably increasing weight and bulk. The Breath Assist is comprised of a small very high pressure (300 bar) air bottle; a patented control valve, a 4 liter expandable air bag with release mechanism, a vented snorkel and pressure relief valve, and a snorkel style mouthpiece with nose clip (see image). All this is folded into a compact zippered case that "rips open" at the zipper when the device is required. The action of pulling the mouthpiece towards the mouth releases the air flow, with an initial full bag charge of air, then a constant air flow refreshes exhaled air in the bag. It is claimed this system won't be exhausted by panic breathing in the same manner as existing systems. This semi-annual event is scheduled for March 28-30, 2001 in Jacksonville, Florida. For more information check out the SAR - The Americas 2001 Web site. We'll see you there! More information on survival signaling devices can be found on the ETS Signaling Group page.